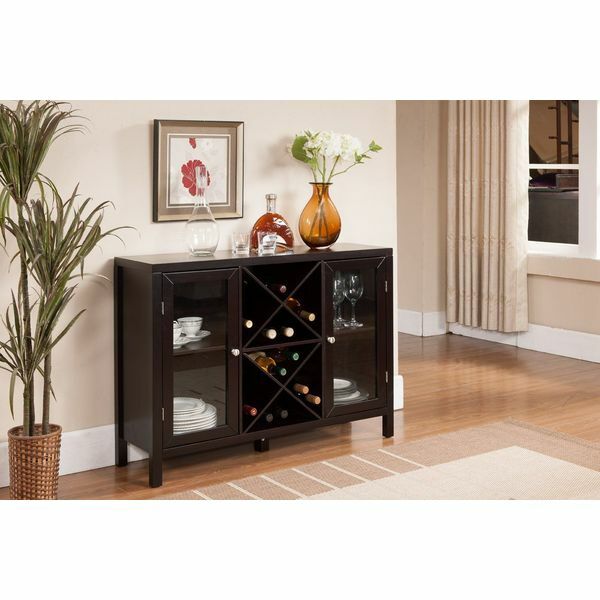 Store and serve your wine in the fashionable Kings Brand Furniture Buffet Cabinet with Glass Doors in Espresso. This richly-colored wine rack provides ample, open space for your wine bottles in a neat and beautiful display. While those are tucked safely into their places, you can access the two additional side compartments that open by way of wood framed glass doors. These compartments are perfect for wine accessories, glasses or decorative trinkets. 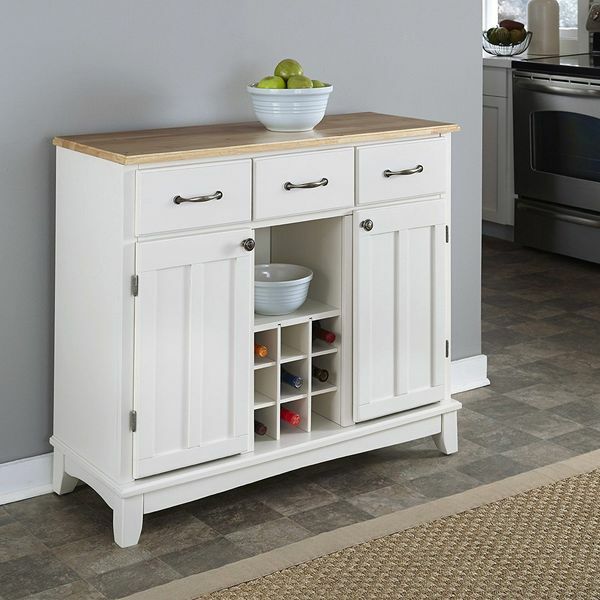 Give your living room, dining room or entryway a fresh new take on storage with the Kings Brand Furniture Buffet Cabinet in Antique White/Walnut. This console table measures 41.75 inches by 12 inches by 30.25 inches, making it a perfect fit in any space. Centrally located under its large surface are two open shelves and a drawer, and on either side are two doors that open up to reveal adjustable shelving. Your kitchen or dining space always needs a bit of multifunctional yet stylish, design. Implement the Hutch-Style Buffet in White/Natural to add storage and additional workspace to the busiest rooms in your home. 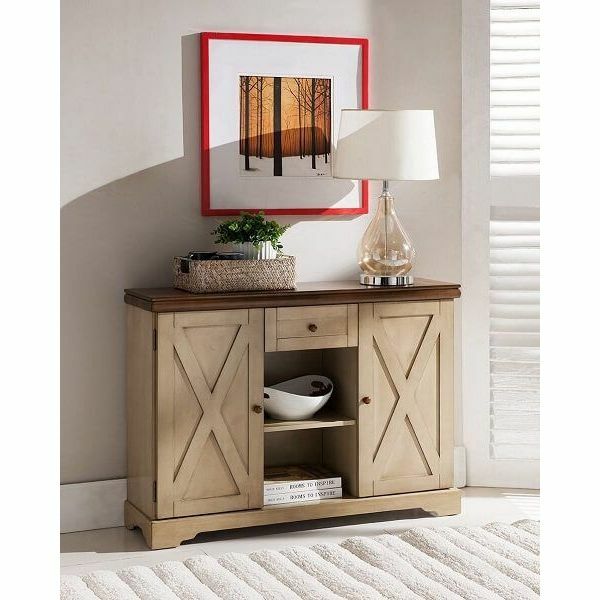 Made from solid wood and veneers, this buffet features a clear coat finish and a white finish cabinet with a natural top. Also, three utility drawers on metal sliders and two cabinets with their own adjustable shelves make for a convenient way to cook and serve from your kitchen and dining room. Add sophisticated charm to your dining area or kitchen with the stunning Aria Buffet. 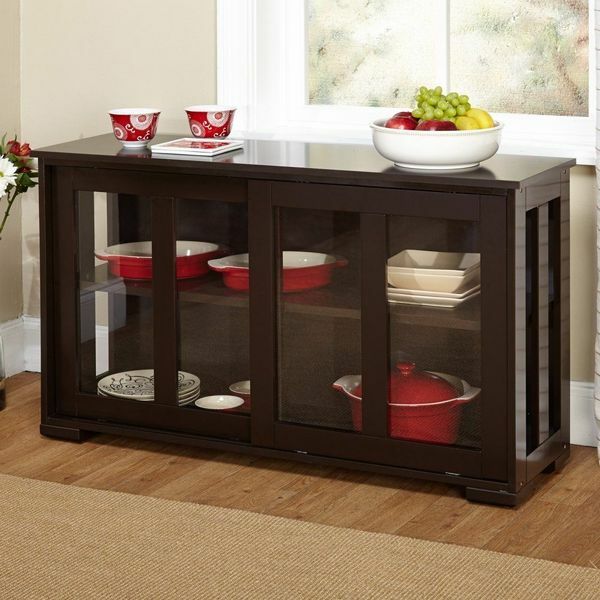 This buffet features both solid wood and glass doors. X-frame style doors open up to reveal two tempered, adjustable glass shelves on either side. Behind the wooden doors are adjustable shelves, and the frame of the entire buffet is made from engineered wood to make it more durable. One, two, or three–no matter how many you have, you can stack all of the Simple Living Stackable Cabinet in Espresso furnishings atop one another to save space. Made from durable, engineered wood that has been finished in an espresso color, this cabinet features tempered glass sliding doors with a single adjustable shelf inside. 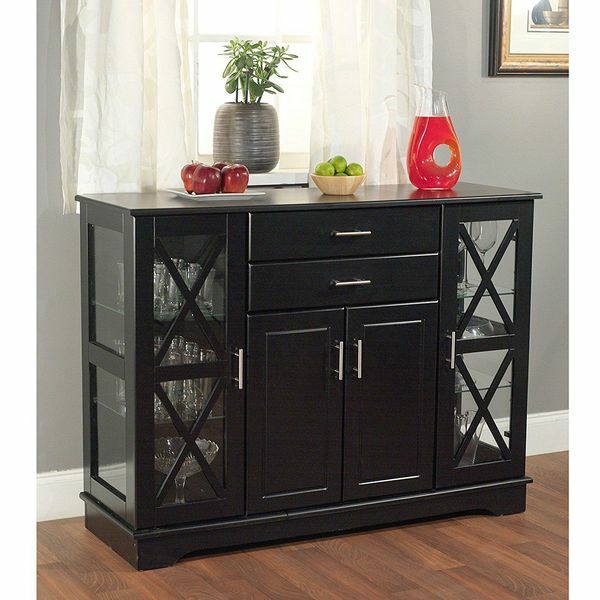 If you enjoy entertaining friends and family with drinks and dinner, the Kings Brand Furniture Buffet Server Cabinet with Wine Storage in Black will make an excellent addition to your home. This 12-bottle wine rack proudly and neatly showcases your collection with two cabinets on either side to store your favorite wine glasses. The top makes for an excellent buffet surface. 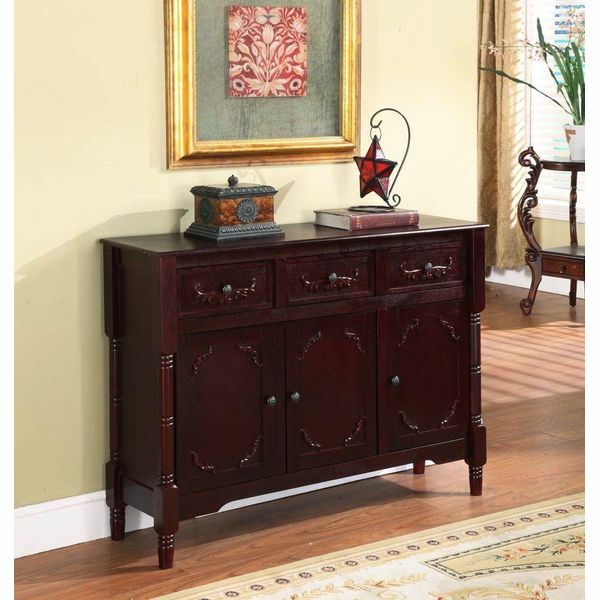 Give your hallway, entryway or living spaces some charm and function with the King’s Brand Buffet Table with Drawers and Storage in a Cherry Finish. Made of solid wood and wood veneer, this cherry-colored console sideboard features three drawers along the top with three doors below them, those of which open to reveal shelves. The doors have antique brass knobs and accents on both the door panels and the drawers. 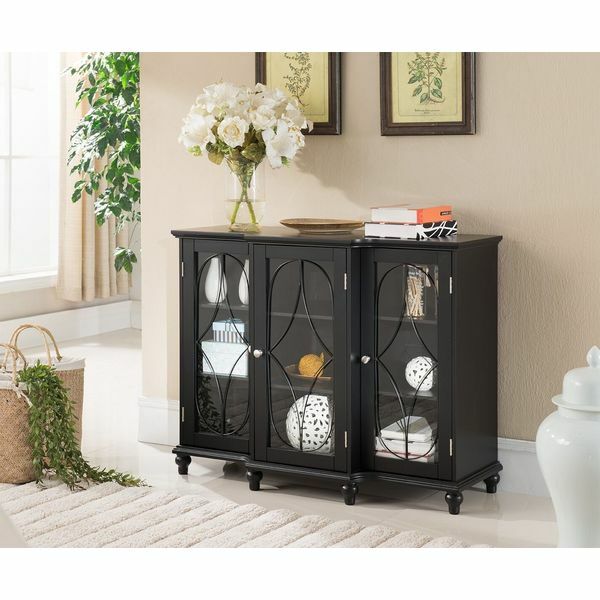 Organize your bowls, plates and other dining room essentials with the Kings Brand Furniture Sideboard Table in Black. 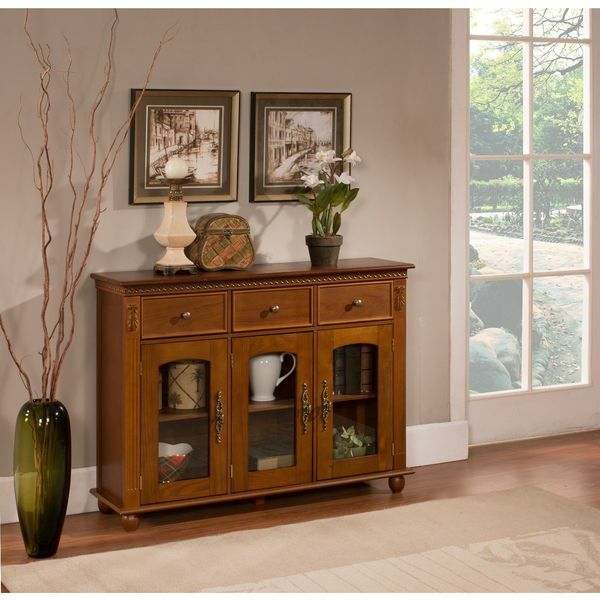 This sideboard features three decorative glass doors that display your fine china or dinnerware. Ornate feet support this sturdy sideboard and will help make for a gorgeous addition to any dining area. 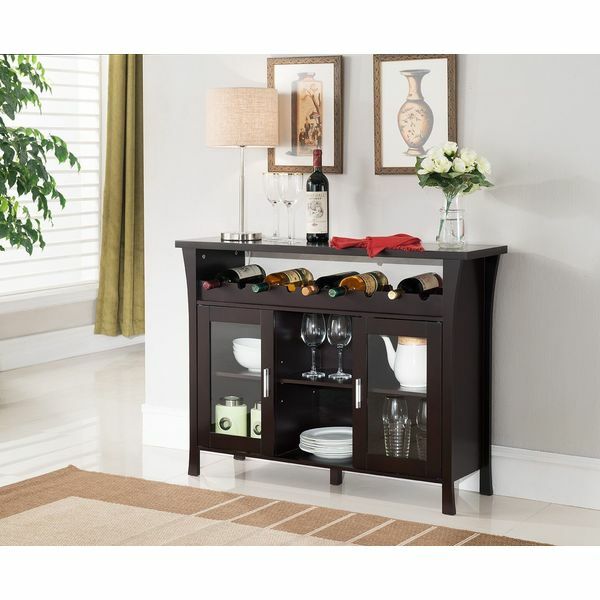 Display your favorite bottles in your wine collection with the fashionable Kings Brand Furniture Buffet Table with Wine Storage in Espresso. 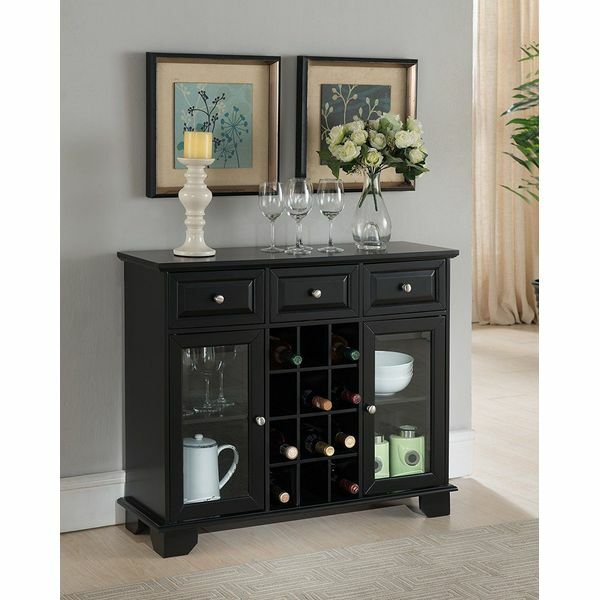 This rack features open storage compartments for inserting your wine bottles in an ornate fashion. Two glass side doors can hold your wine glasses or other accessories and put them on elegant display. Perfect for easy storage in any entryway, hallway, office or living space, the Kings Brand Furniture Buffet Table with Storage in Walnut delivers traditionally-styled storage where you need it most. It features three large storage drawers along the top of the console table, and below you will find two shelves for additional storage hidden behind each of the three glass doors.